This item is sold per 4.8 oz gift bag. NUTRITION FACTS: Serv. Size: About 2 pieces (47g). Servings: About 3. Amount Per Serving: Calories 230, Fat Cal. 100, Total Fat 11g (17% DV), Sat. Fat 7g (35% DV), Trans Fat 0g, Cholest. 5mg (2% DV), Sodium 130mg (5% DV), Total Carb. 30g (10% DV), Dietary Fiber 3g (12% DV), Sugars 16g, Protein 3g, Calcium (2% DV), Iron (10% DV). Not a significant source of Vitamin A or Vitamin C. Percent Daily Values (DV) are based on a 2,000 calorie diet. 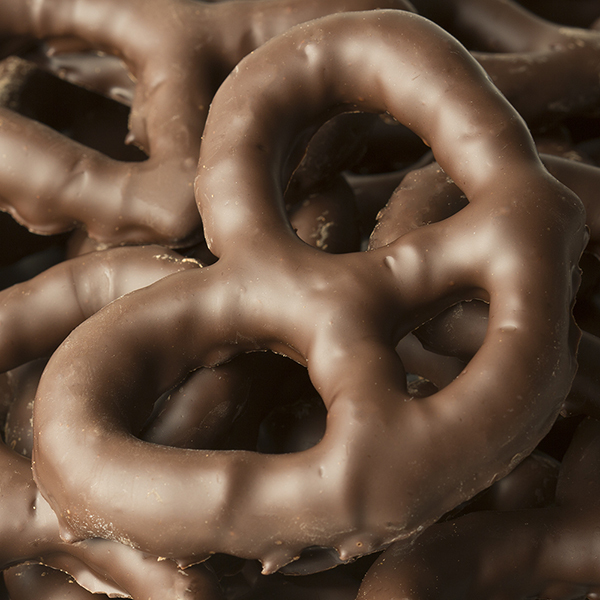 INGREDIENTS: SUGAR, CHOCOLATE LIQUOR (PROCESSED WITH ALKALI), PRETZELS (SOFT RED WINTER WHEAT FLOUR, SALT, SUNFLOWER OR CANOLA OR RICE OIL, CORN SYRUP, MALT SYRUP, YEAST), COCOA BUTTER, MILK FAT, CONTAINS 0.5% OR LESS OF THE FOLLOWING: SOY LECITHIN (AN EMULSIFIER), VANILLIN (AN ARTIFICIAL FLAVOR), NATURAL FLAVOR, VANILLA EXTRACT. ***Shares equipment with products containing peanuts, tree nuts, milk, egg, soy, fish and wheat. I added these to my hotel welcome bags & they were a huge hit! Excellent quality chocolate, cute packaging & none of the pretzels were broken (def a plus).